On April 24, 2016, the Thruway Authority implemented cashless tolling on the former Tappan Zee Bridge, now known as the Governor Mario M. Cuomo Bridge. A second and third location followed on March 29, 2018 with the addition of cashless tolling at the Grand Island Bridges, and the Harriman Toll Barrier converted to cashless tolling on September 28, 2018, which complements the $150 million reconstruction of the Woodbury Transit and Economic Hub. On November 16, 2018, the Yonkers Toll Barrier converted to cashless tolling, and on December 20, 2018, the New Rochelle and Spring Valley Toll Barriers transitioned to the system. 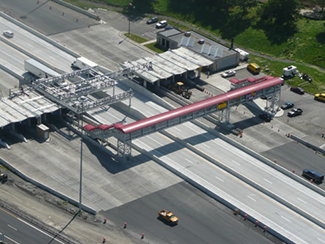 These four toll barriers represent 22 percent of total traffic volume on the Thruway system. The conversion to cashless tolling is expected to save each commuter approximately 200 minutes annually. The Thruway Authority will transition to cashless tolling system-wide in 2020. 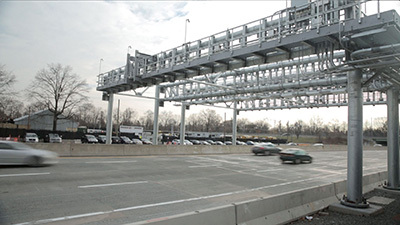 Cashless tolling reduces congestion, improves traffic flow, is better for the environment, and allows for non-stop travel on New York’s toll roads, bridges and tunnels. Along with the conversion of the Harriman Toll Barrier and Yonkers Toll Barrier, the remaining fixed toll barriers in the lower Hudson Valley will convert to cashless tolling by the end of 2018. This includes New Rochelle (I-95) and Spring Valley (I-87-Commercial Traffic Only). Altogether these four toll barriers represent 22 percent of total traffic volume on the Thruway system. The conversion to cashless tolling is expected to save each commuter approximately 200 minutes annually. As part of the Thruway Authority's (Authority) continued commitment to Environmental Stewardship, the Authority offers a Green Pass Discount Plan for E-ZPass customers who own hybrid vehicles. This plan offers a special 10% discount to hybrid vehicles that get at least 45 miles to the gallon and meet certain emissions standards. To find out more information on this program, please visit the Green Pass Discount Plan page. In response to increasing traffic volumes on the Thruway System, the Authority is studying the establishment of Highway Speed E-ZPass lanes at certain toll booths on the System. These lanes allow E-ZPass tag holders to drive through select lanes at the posted highway speeds, paying the toll electronically as they continue to drive. Highway Speed E-ZPass processes more vehicles than manual ticket distribution and collection and allows cars and trucks to move more efficiently through toll plazas. As such, Highway Speed E-ZPass improves air quality by reducing idling and emissions. In addition, it reduces fuel consumption, congestion and travel time. Currently, Highway Speed E-ZPass lanes are installed at the Spring Valley and Woodbury Toll Barriers. It is predicted that Highway Speed E-ZPass will eventually service up to 75 percent of traffic passing through a toll plaza during peak travel times.